In September 2013, I started receiving emails from every "guru" and his dog about the Amazing Selling Machine (ASM) by Jason Katzenback and Matt Clark (which is not surprising after I found out that a big chunk out of the $5000 price for ASM is paid out as affiliate commission to people who promote it). The promo videos were certainly well done and I was intrigued by the idea of creating and selling my own private label products on Amazon. I was ready to join in after going through the long series of sales pitch videos, then they dropped the price bombshell. What did I do? I started searching for Amazing Selling Machine reviews, Jason Katzenback reviews and Matt Clark reviews - like you're probably doing right now! After all that is basic common sense before spending such a considerable sum. To be honest, I did not find anything compelling. The crowd-sourced opinions were mixed at best and certainly gave me no confidence to part with about $5000. Many of the people promoting it are what I would consider spammers. People who push shiny objects with the main purpose of making a quick buck off their email subscriber lists. The value of the program is not worth the price. Sure there is good content but it is really basic. I personally know a person who signed up for the ASM and was really disappointed because she felt the content did not justify the price at all. By the way she is a true guru who was a single mum struggling to raise her kids just 2 years ago but is now making over $1 million a year while homeschooling her children. Newbies can get badly burnt. In September 2014, I met a lady who was in the last ASM course. She shared how she is in the middle of a huge mess after her ASM mentors got a bunch of them into private labeling health supplements. She has paid for the Amazing high fees, is out of pocket from ordering from one of the recommended manufacturers who messed up her product, has not been able to sell a single unit of the products and is battling to get a refund. She's lost thousands of dollars and might eventually have to file a lawsuit to recover something. What a mess. To be fair, I also know one person who took the course and has had success with his private label products. But he is also a member of Jim Cockrum's My Silent Team/Proven Amazon Course community and other well-grounded, zero-hype groups. Matt Clark and Jason Katzenback only train you to be a one-trick pony...in a field where you can have multiple income sources and strategies. And that one trick is not something I would ever recommend anyone start with. It's like shoving meat down a baby's throat before they have been weaned - potentially very dangerous. There are easy (even free) ways to START selling on Amazon that will allow you to learn the ropes without risking thousands of dollars. My suggested steps are outline here. If you have $5000 available for the course and several thousand more to manufacture your own private label and are prepared to risk it at one go, then the ASM might be your cup of tea. I am not anti-ASM, but I do think it is very expensive, can be risky and there are better alternatives available. The best thing that emerged from my searching - the name Jim Cockrum kept coming up as someone with a proven track record and pretty much undisputed recognition as a trustworthy, honest and true authority in the Internet Marketing/Online sales arena. That led me to Jim Cockrum's Proven Amazon Course (PAC). After a few days of research and deliberation I finally bought into it and after 11 months, I always tell people it has been the best investment I have ever made in my life. In the end it became a matter of Amazing Selling Machine vs Proven Amazon Course. The overwhelmingly positive reputation of the Proven Amazon Course and Jim Cockrum. Btw, I've now met Jim Cockrum in person twice and had dinner with his family. He is one of those rare people I call "The Real Deal" - down-to-earth, honest and humble. Someone who values serving others, with a vision to empower people to become entrepreneurs (which is one of the reasons he prices the PAC so affordably). The price! The Proven Amazon Course costs a fraction of the Amazing Selling Machine - $399 vs $4997 (prices updated on Oct, 2018). That's a 12.5X cost difference! In other words ASM costs 1250% more than PAC, or you can see it as PAC costs 92% less than ASM. Lifetime moneyback guarantee. This beat the 30 day ASM look-in period hands down, which teases you with insufficient crumbs to get you past that 30 day point of no return. On the other hand, PAC has been around for over 10 years and they have a stellar support team that stands 100% behind what they say. Almost 4 years after joining PAC, I have absolutely no regrets. I now earn a full-time income from selling on Amazon and that is just part of a larger picture of building a multi-faceted business with multiple income streams that includes but goes far beyond private labeling your own products. If you are serious about building your own business with real resources and support from a community with great integrity and zero hype, check out the Proven Amazon Course. You can also join the free My Silent Team/Proven Amazon Course Facebook group where you can witness and interact with the amazing PAC community before you commit. The video below is a quick review of the latest launch of ASM8 and PAC with the latest updates as of October 2017. Proven Private Label 2.0 (PPL2.0) is now included in the Proven Amazon Course (PAC). In other words, when you get PAC you get PPL2.0 for free! The 3rd edition of "How to Import from China and Many Other Countries" has been added to PAC. This guide provides an incredible amount of useful information about how to source, ship, check certifications, etc. Update (Feb 2017): Proven Private Label 2.0 has just launched (As of 17 Oct 2017, please don't buy PPL2.0 on it's own as it's now included in PAC). I have started going through the course and can say that it's very similar to what I do. Most of my sales are in fact "Private Label the Easy Way" type products, including my first and oldest private label product which is currently ranked Top 1.9% in Beauty and another easy way SKU at Top 0.014855% in Industrial & Scientific! One note: All the "Proven" modules are initially launched as standalone courses. They can be purchased separately for those who want to get them at launch. However if they are related to selling on Amazon, they will be added to the Proven Amazon Course about 6 months after launch. This means that if you buy the Proven Amazon Course, you get continual updates at no additional cost - making PAC an incredible value, with course content that is constantly being improved and updated. Update (Mar 2016): Just filed my income tax and it's the highest I have ever paid - thanks to the income I now make as an entrepreneur that all started with PAC! I also paid down my mortgage by $60,000 and paid for a brand new vehicle in cash (if you know anything about vehicle prices in Singapore, then you know that's a substantial amount). Update (30 Aug 2015): Just wrote my Proven Amazon Course Review including a screenshot of its contents. Update (Oct 2018): The Proven Amazon Course (PAC) has undergone a major upgrade and is now know as PAC 2.0. It a huge upgrade that includes both the content, user interface and structure to make it much more user-friendly, which was the main weakness of the old PAC due to the huge amount of content. Find out more in my Proven Amazon Course review. 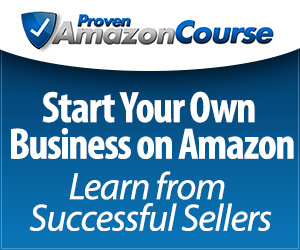 Check out the Proven Amazon Course or read my review here. "Bought PPL yesterday and we are super excited about it. Just to let everyone know how much faith we have in Jim Cockrum & Tom Freeman, just yesterday we canceled our Amazing Selling Machine program while we we still in the 30 refund period. I can assure you, we would not have done this if we were not 110% confident in Jim & Tom. We are looking forward to getting to know you all and when we need advise or a hand with something as we progress through this, being able to have a real support team to help us with things, when we need it...But what I can tell you right away and is one of the main reasons we did make the change was, having training from Jim & Tom on creating multiple channels to sell your same private label product via, Amazon, EBay, your own ECommerce site. As well as the other ways that Tom mentioned in the intro video. Amazing Selling Machines is primarily focused solely on selling your product on Amazon. As Tom illustrates in the chart in his intro video, by using multiple marketing channels to sell your products it will seriously explode your sales volume VS just focusing on one channel, hope that helps."